When this old Italian farmhouse was renovated, boards salvaged from outbuildings were brought in to make doors, beams and furniture. I’ve had this magazine clipping on my bulletin board for five years and have never grown tired of it. 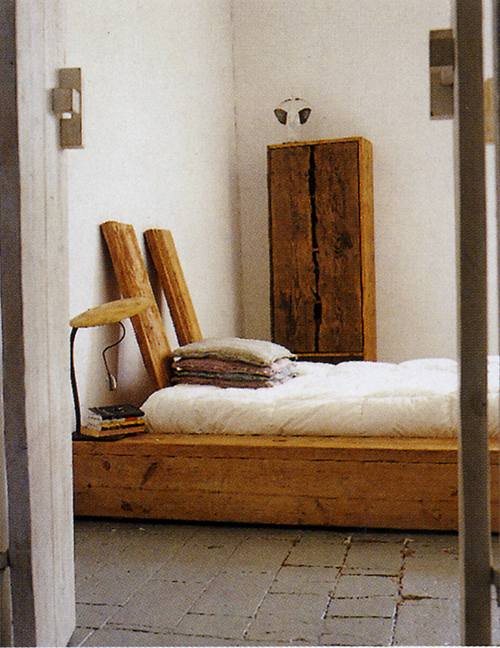 The beautiful bed, which probably works because of the thickness of the slabs and the buttery colour, wouldn’t actually be that hard to make if you had access to long heavy planks like these, but admittedly that’s a big if. Also, it looks as if the boards were either cut a long time ago or cut more recently on older equipment – they have that irregular profile. Still, something approximating this bed could be produced, and for much less than buying something readymade of similar quality. Reclaimed planks can be found if you look hard enough, and the design is simple enough for most woodworkers to pull off. (There are probably slats under the mattress for aeration, which would certainly be recommended.) The dual headboard made from two slanted boards is clever, and the tall wardrobe and the solid slab doors throughout the house are nice too. The stone floors would be hard to improve on. 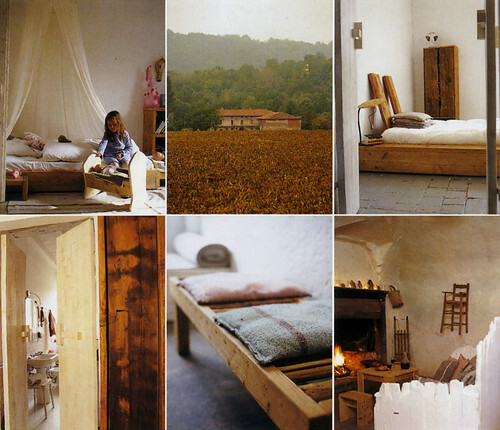 From Italian Elle Decor, December 2004. This entry was posted on Tuesday, April 21st, 2009 at 6:55 pm	and is filed under design. You can follow any responses to this entry through the RSS 2.0 feed. You can leave a response, or trackback from your own site.